The results of the Irish Butterfly Monitoring Scheme for 2018 have just been released. Thanks to the 110 volunteers who walked 115 transects in 2018, and recorded more than 46,000 butterflies, we are able to produce detailed trends on butterfly populations since the scheme began in 2008. The good news is that as a consequence of the weather experienced in 2018, overall populations of our commoner and widespread species were up by 29%. The overall trend in Irish butterfly populations since 2008, however, is still a decline of 6%. Peacock and Silver-washed Fritillary showed the strongest growth in populations, whereas the Small Heath experienced the strongest decline. 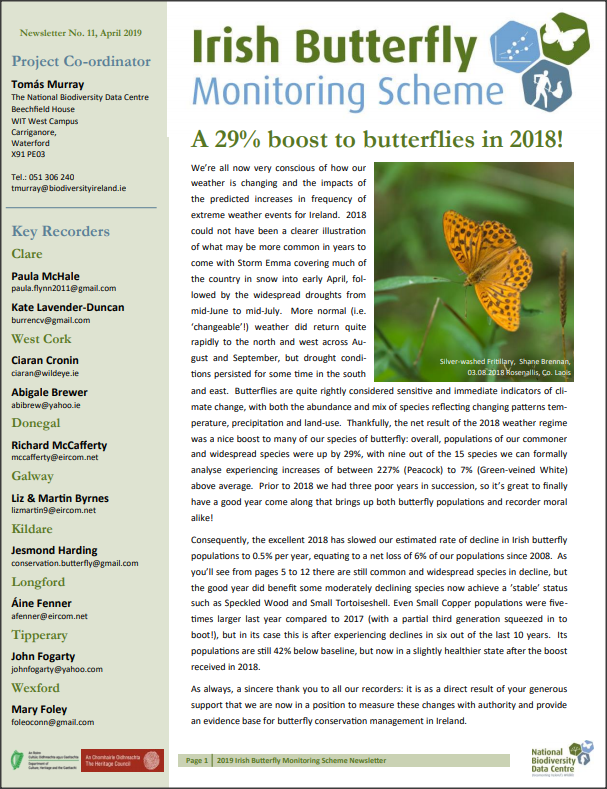 The full details of the monitoring scheme can be read in the Irish Butterfly Monitoring Scheme’s Newsletter which has just been published (Download here: 2MB). More information on the Irish Butterfly Monitoring Scheme is available from the Irish Butterfly Monitoring Scheme website. As 1st April marks the beginning of the 2019 Butterfly Monitoring Survey, we hope that the information whets your appepited to get monitoring again in 2019.